In a previous Past Tense, I talked about Outhouses of Stow and indicated that there didn’t appear to be any outhouses still remaining in Stow. Not so! The day after, several e-mails from at least 4 residents came in describing outhouses on their property. Actually, all but one were ‘in-houses’ since they were actually located in a corner of the house or barn, but there was one that was an actual outside outhouse. I won’t say where to avoid embarrassing anyone, but it is right here in Stow between their barn and chicken coop (see picture). John Makey tells the story of a fancy two-door outhouse that was located on the Stow upper common, at least for a short while. It was back in 1945, WWII was just over, and suddenly on the morning after Halloween, an outhouse appeared on the town common. It was fancy and had two doors and the inside was plastered and all shiny, not the normal plain wood outhouse. It was not functional during its short time on the common, and also not wanted by the town fathers who knew that it wasn’t the property of the Town, probably a Halloween prank, and arranged for it to be removed. The town workers were loading it on a truck just as John, who was only in the 8th grade at the time, was coming home from school and was asked, probably in jest, if he wanted an outhouse. John surprised them by saying “sure”. So rather than going to the dump, the truck took the outhouse and John to John’s house and dumped it in the Makey front yard. When John’s father saw the new occupant in his yard, he was impressed and said “Gee, that is a fancy one. I’ll have to dig a hole for that and replace our old one”. A few days before he and his father got around to installing the fancy outhouse, a truck came and took it away. Probably the original owner of the outhouse tracked down where to find it and promptly took it back. John never knew where it came from or where it went. Bob explained that it was just after the war and he and a couple of veteran friends were looking for something to do, and since it was Halloween night, they decided that the Town Common needed an outhouse. So they borrowed the family farm truck, drove down to the Hudson Rod and Gun club, stole their outhouse, and set it up on the Common, all done before the sun came up. Bob knew that John and his father were given the outhouse and presumed that they converted it into a chicken coop. 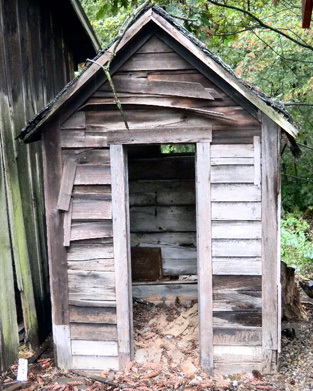 It only took 50 years for John to find out where the outhouse came from and probably where it was returned. Now, all of you know as well.